I believe such an attempt is being made in a post that appeared in the (now) anti-WikiLeaks wikileaks-forum.com website with title ‘Facts about the WikiLeaks Forum’ which I have archived here: archive.is/uF1lS. The same post also appears at the support-julian-assange.com blog under the heading ‘The History of the WikiLeaks Forum’ which I have archived here: http://archive.is/Gw2mw. Both domain names have been the property of the same person, set up and controlled by Mark for as long as I was a member (18 months) of which a moderator (91/2 months). Since WikiLeaks was enduring financial problems due to the banking blockade, sufficient funds were unavailable to help support the forum’s financial needs so it had to be privately financed. This occured on 2nd March 2012*. At this point in time, the forum was listed as an “ Endorsed WikiLeaks Support Site“ on the Wikileaks Supporters Page. But no mention is made of the Donation button inserted at the forum in 2012 or the individual donations made by members to the owner of the forum. As some of you may have noticed, I have placed a ” Donate ” button at the top of the forum which will be visible for members only. The bottom line is that I MUST move the forum before it is taken down by my current hoster ” Hostgator ” who already fired the first warning shots last week. As I mentioned, this is just a sign of things to come and i can only expect it to get worse. http://www.paypal.com, Mit PayPal zahlen Sie einfach und sicher, und Ihre Kreditkartendaten bleiben geheim. Ma Rk ‎:-) as oon as we get the hosting we need, we can take off the ” donate ” button. A few days before, Mark had shared with the rest of the mods/admins at the staff room that he had been financing the forum out of his own pocket and he had asked for ideas on how to raise finance. No one raised any objection for this and a Donation button was an obvious choice, although not the only one put forward at the time. Please let me pay for the first year, then we have time to do the fund raising project properly. I can do bank transfer to you or paypal to the provider directly. And of course I will not tell anyone (apart from my husband of course). pay for the first years hosting ? Mark, I hope you will find the most suitable solution. I am glad you are not alone in this. My offer is there for now or whenever it is needed, for a similar amount. I am certainly not a millionaire. no – just middle of the middle with a mortgage to pay but comfortable enough to be able to make this payment without regret. I am sure you will choose the best this is good. you are not alone Mark although you carry all the responsibility. ok, so you will let me know what to do when the time is right? As it is obvious from the conversation I was utterly convinced that there was need for finance as I was utterly convinced for his noble intentions as far as supporting WikiLeaks was concerned, despite any personal weaknesses he may have. As long as he carried the responsibility alone for the forum, I felt at the time, he deserved my help and support. But, many things have changed in my mind since then. His utter change towards WikiLeaks became evident to me in the period of late June/July/August 2012, When he not only withdrew his support but actively used the tools he had available to start undermine and do harm. It was this change alone that made me take the decision to withdraw my help by leaving his team and the forum behind. I no longer wished to legitimise him or be part of his efforts to undermine WL and bring confusion and strife among the community. He had already started attacking publicly good supporters via the WLForum Twitter account. 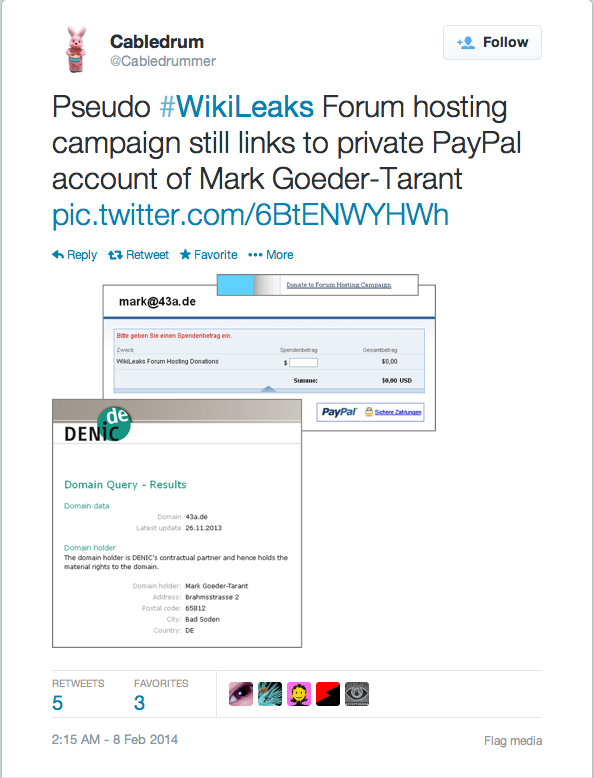 But, going back to the story, why does the ‘Facts about the Forum’ or ‘The History of the WikiLeaks Forum’ make no mention of the ‘Donate’ button and any funds that were raised for the forum’s new Hosting? It is hardly a secret anyway. Several mods/admins added the request to donate in their forum signatures as I also did at the time. Furthermore, Mark did start a thread at the forum acknowledging each donation by mentioning the amount but keeping the donor anonymous. I re-call two entries had been made in that thread by the time that I left the forum. One of those donations ($100) was mine made on the 8th of June 2012. This email confirms that you have donated $100.00 USD to Mark G***** (redacted e-mail) using PayPal. The exchange rate for this purchase is 1 British Pound = 1.49678 US Dollars. This credit card transaction will appear on your bill as “PAYPAL *MARK”. * I think ‘mayya’ meant to say 2nd of March 2011 instead of 2012. 2011 was the year the forum was established not 2012. Even this simple fact, can’t they get it right?